There was a poster at SVP last year that said the length and shape of the crest is related to ontogeny. "It's noteworthy that this specimen is actually larger than the specimens with long head crests." like i said it was just a poster, and i didn't see it since it was on a different day then when i was there. We'll have to wait for the paper to see what they make of this. To some degree the length of the crest has to be based on ontogeny (i.e. they weren't born with large crests, as 'Peanut' demonstrates). But whether that explains this specimen is less obvious (e.g. the crest shape isn't the same as P. walkeri - even if it grows longer). But hopefully more specimens and more analyses will tell. I know there's lots of speculation as to whether or not this is a subspecies or even a female, but what if it's simply deformed? 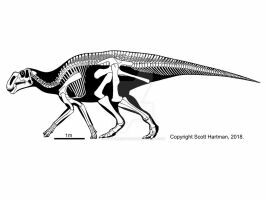 While Parasaurolophus is quite a rare Hadrosaur, there are several specimens of both short and long crested variants. It seems the three valid species are also from different areas and ages. So while we could use more specimens to get better more accurate information, right now it seems unlikely that there is sexual dimorphism or that one variant is deformed. Nice job on the Ornithopods. 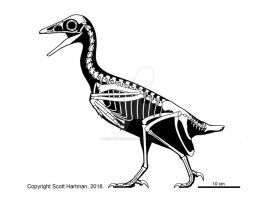 Really nice reconstruction of this species. I've been wondering, what do you think of Gregory S.Paul's reconstructions? As I have a question in regard to his reconstructions of lambeosaurines that I don't fully understand. Greg does solid work. I don't agree with all of his biomechanical and soft-tissue interpretations, and when our skeletals differ it's obviously because I think it's different, but he also set the standard originally, and I take all of his skeletals as worthy of serious consideration, even if I end up disagreeing with him. Well, one thing about his lambeosaurine reconstructions I've never understood, nor have I ever seen in the art from others, was how he has direct skin attachments from the neural spines above the shoulders to the base of the skull, and in some species with larger crests, attached to the crests themselves. I've never seen the explanation for this reconstruction, and while I personally find it hard to believe due the lack of mobility it must cause, I am really curious as to why he gave them this feature. I actually wrote a paper on this, although it was for a conference at a small regional museum (the Tate Geological Museum in Casper. WY) and I'm not sure the proceedings volume is available anymore Anyhow, the orientation of the neural spines on the back appears to be an osteological correlate with neck depth (this works in extant animals as well), but over the years Greg has made several changes to how deep he interprets that. For his life reconstructions he thinks that there were fleshy skin crests along the back and neck in some lambeosaurs that made the neck look even deeper and attached to the crest (in particular he interprets the AMNH Corythosaurus mummy as exhibiting this). 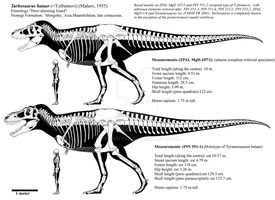 There do appear to be some really deep-necked hadrosaurs, and others with more horse/camel musculature (in terms of depth, not as a literal placement of the individual muscles) - so hadrosaurs show a bit of a range, which probably shouldn't be surprising, since extant ungulates do the same thing. Huh... That is actually really interesting, I've always found those deep neck reconstructions a tad odd, as they seem as though they would inhibit vertical movement of the neck, though I guess that goes to show how little I know about anatomy. I wasn't even aware that some ungulates do this as well. Which modern ungulates have this feature? This is feature is mostly present in lambeosaurines, correct? 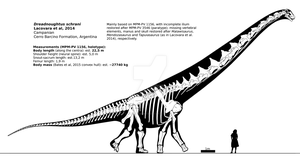 As I haven't seen hadrosaurines with similar reconstructions. "Restriction" can be a good thing - e.g. some ungulates actively have to use their ventral neck muscles to oppose their nuchal ligaments if they want to put their heads down to the ground to drink, etc., But then the neck raises with ease as that stored elastic energy helps pull it back up. So maximizing efficiency really depends on what sort of routine posture they adopt, and how frequently they change it when feeding, etc. I think the females had longer crests, but still much shorter than the males. This could just be a different variation, or even a juvenile. This specimen is actually larger than the specimens with long tubes, so it's unlikely to have been a juvenile. It's head looks proportionally, smaller than that of P.walkeri to me. Do you think it's likely that this is a female? I've been asked to design dinosaurs for a video game, and I'm trying to decide whether or not to base the females on "P. cyrtocristatus". Is it possible that P. cyrtocristatus is different enough from P. walker and P. tubicen to warrant its own genus? It may be, but remember that calibrating a "generacometer" is basically an act of capriciousness. So did some researchers in decades past, but it doesn't appear to be correct. Interesting, never knew P. cyrtocristatus (wow, I spelled that right) was larger than P. walkeri and P. tubicen. How much bigger was it? I WOULD LOVE TO SEE A COPY OF THAT PAPER--AND ANY OTHE PAPER ON THE NECK MUSCLE/TENDON/LIGAMENT STRUCTURES OF HADROSAURS. Perhaps with the crests its simply a question of genetics. 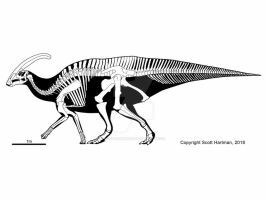 Maybe there was a recessive gene in Parasaurolophus that generated smaller crests? Some house cats don't have tails while others do, but despite that all house cats come from the same species, felis catus Granted, that's not the best possible analogy, since a nasal/head crest is a different kind of beast all together from tail vertebrae, and there might be some skeletal differences between this specimen and other Parasaurolophus specimens that I'm missing (aside from the mentioned size factor.) But maybe that's the deal with the head crest - just a recessive gene. I have a question, and I was wondering if you could clear this up. 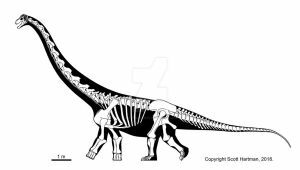 When I was growing up, hadrosaurs like this were drawn with thin, graceful necks. 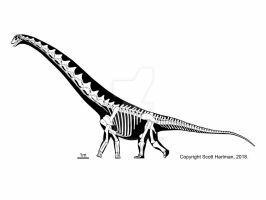 Recently, though, I've seen a lot of people draw hadrosaurs and ornithopods with a really thick neck that makes the back of the neck completely flat. 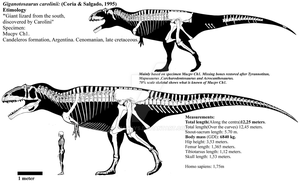 Look up "ornithopods" on Wikipedia and take a look at J. Conway's illustration if you don't know what I mean. 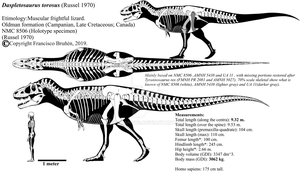 Do you know what caused people to re-think the hadrosaurian neck? I know it's a petty issue, but I've always been curious. Great service you're doing here with the skeletals, my friend. Hartman, Scott. 2002. 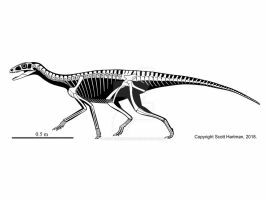 Estimating nuchal ligament depth in hadrosaurid dinosaurs: The return of the pencil-necked hadrosaurs? Tate 2002 Field Conference Guide. 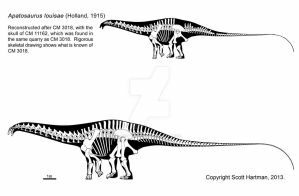 In it I showed that there are osteological correlates in the neck of modern mammals and hadrosaurs that let you predict relative thickness. My hypothesis has so far been forn out byt he depth of the neck musculature in Leonardo, the mummified Brachylophosaurus. 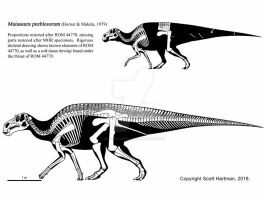 In short, some hadrosaurs had quite stocky necks, while others seem to have had thinner necks. This really shouldn't be suprising, as extant ungulates also show a wide range of neck adaptations, depending on their foraging behavior. There are also two Edmontosaurus mummies, Leonardo and Dakota, if I'm not mistaking one of them still had some neck muscles preserved. 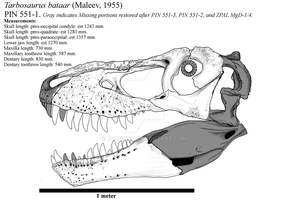 This could perhaps be the source of the thick neck for Hadrosaurids. I would like a copy of your paper if you ever do make a PDF.